Help with the transition for the person that is now a senior citizen by nicely giving them the Over The Hill Award Ribbon. The keepsake ribbon is a fun gift to give to the person that is celebrating a new milestone age. 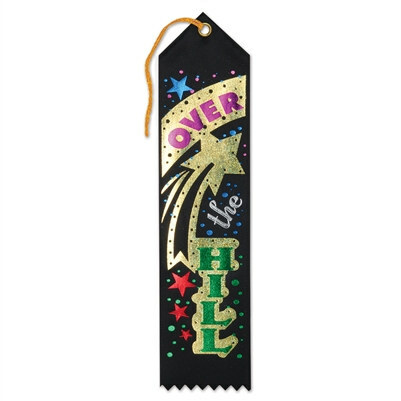 The ribbon has a black background and colorful lettering that reads Over The Hill. The gift has a gold tassel attached at the top and a serrated bottom edge. On the back of the ribbon a small white card is attached that can be used to write in a name.